London's streets are awash with blue plaques, each commemorating the life or work of a person of note. The blue plaque scheme has been in place for well over a hundred years. These commemorative plaques are not always blue in colour, however, and they are erected by the various bodies involved in the scheme, with English Heritage being the main one. Plaque-spotting while ambling around London can make for an interesting exercise, but not all famous former residents of an area or suburb are as yet honoured with a plaque. Brixton has had its fair share of famous faces. Read on to discover who's called Brixton home. Beloved comic actor and filmmaker Charlie Chaplin once lived with his brother Sydney in a mansion block flat at Glenshaw Mansions. Chaplin's life story was a classic 'rags to riches' narrative, and after a bleak childhood largely spent in penury, residence at this building in Brixton gave the young aspiring cinema star a little stability. In his autobiography, Chaplin referred to this flat on the Brixton Road as his 'cherished haven'. The blue plaque from English Heritage was unveiled by Paul Merton, comedian and Chaplin fan, in 2017. A writer, cricket journalist and indefatigable political activist, Cyril Lionel Robert James was of Afro-Trinidadian descent and moved to Lancashire in 1932, and London the following year. James was involved in the anti-colonial struggle, and championed Pan-Africanism and the socialist cause with zeal. 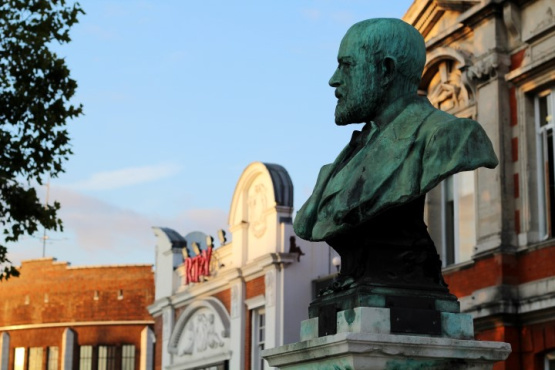 His travels across the globe culminated in living out his final years in Brixton. In 2004, English Heritage erected a blue plaque at 165 Railton Road to honour his life and mark his connection with the area. An actress and singer who largely performed in musical comedies, Ada Blanche was a favourite with theatregoers and was an accomplished actress. Blanche also participated in vaudeville, burlesque and farce, in addition to pantomime. Born in Brixton in 1862, she rose to be a stalwart of the British stage, enjoying a 45-year career. Blanche lived to the ripe age of 90, but died in Chiswick, not Brixton. Another who is Brixton-born, Frank Reginald Carey, a member of the Royal Air Force (RAF) who served in WWII, lived a long life (he died aged 92). Carey achieved an exemplary service record and served for many years in the RAF, achieving the rank of squadron leader and wing commander at varying times in his flying career. Born in Brixton in 1901, Phyllis Digby Morton was a fashion journalist noted for editing Woman and Beauty Magazine. Something of a trailblazer in her field, under Morton's editorship the magazine became more probing and provocative, taking on new topics of discussion, often to the dismay of the magazine's publishing company board. Morton is also credited with being one of the first to pen an advice column. We could list many others famous faces, David Bowie included, whose untimely death resulted in the construction of a shrine in Brixton, and many events were held to celebrate the life and career of the Brixton-born singer-songwriter and occasional actor who Rolling Stone magazine recently paid tribute to as the 'Greatest Rock Star Ever'.